Then add only one or two teaspoon of ice water at a time and slowly knead into soft dough. Wrap up in a plastic bag and put in the refrigerator for 4-5 hours or overnight. Mix one fruit at a time with ¼ cup of water, ½ castor sugar in a saucepan and put on stove. 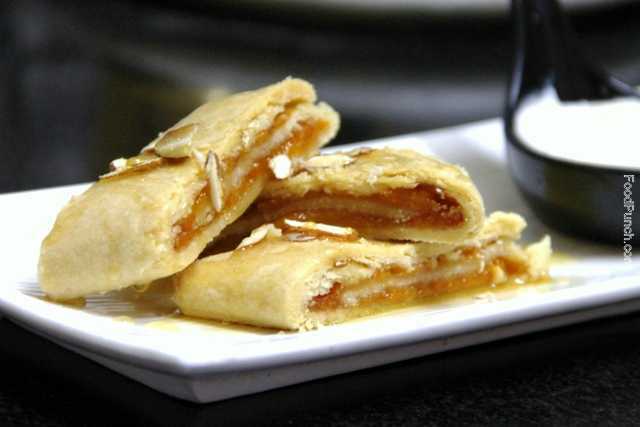 Add a cinnamon stick and ½ of a cracked nutmeg and reduce till the apple and peach respectively are soft and the caramel is reduced to a thick consistency. 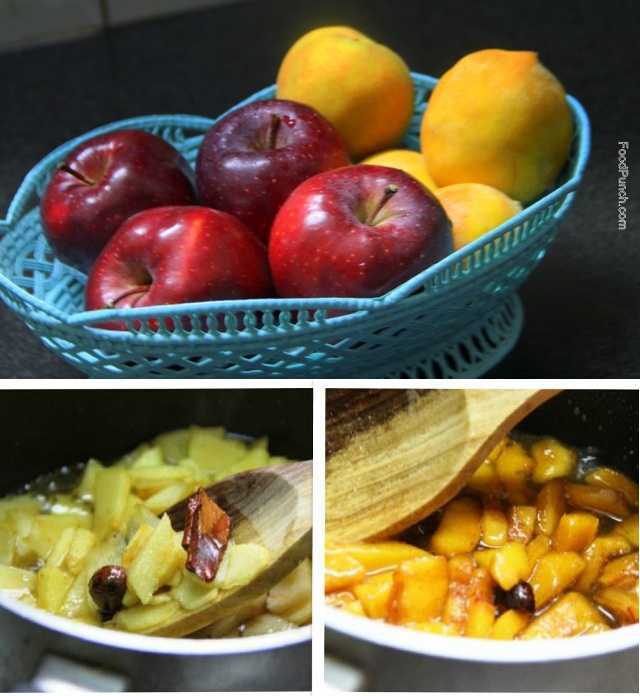 Follow the same process for each fruit separately , remove from stove and add a teaspoon of lemon juice to each and spread on a wide dish and set aside for cooling. 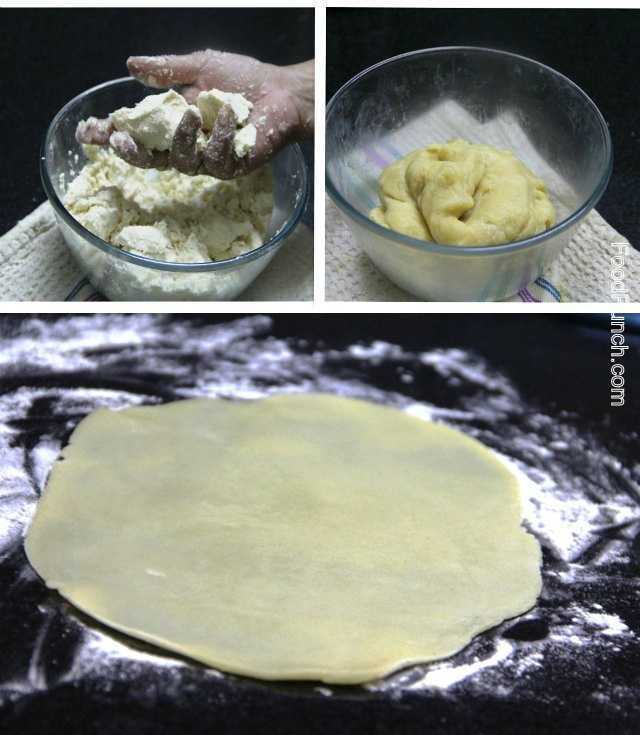 Set the microwave /oven to preheat at 250o C.
Dust the rolling surface with some loose flour, divide the dough into half and roll each into a thin oval shape pie crust, approx 10-12 inch in length. 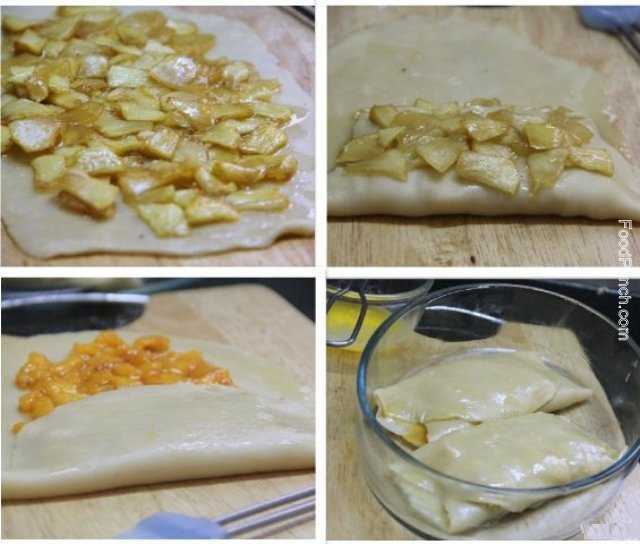 Brush the surface of the pie crust with a generous amount of butter and spread the apple filling over one crust making a nice thick bed and peach filling over the other crust. Roll one length side halfway over the pie and generously brush the plain top with butter. Then carefully pick the other open end and fold it over the top, tuck in the filling if it gets scattered. Repeat for both the pie fillings. Place each roll in a pre-greased baking dish and then generously brush butter all over and around the pie wrap. Bake on the lower shelf of the oven or microwave at 250oC for 15 minutes (for microwave choose the convection setting) and then lower the temperature to 175-180oC for 40 to 45 minutes until the crust is golden and crispy. Cut each pie wrap into four pie rolls and garnish with honey or golden syrup and almond flakes and serve with vanilla yoghurt. Do add a teaspoon of corn starch to the filling in case you feel the consistency is difficult to hold while rolling. 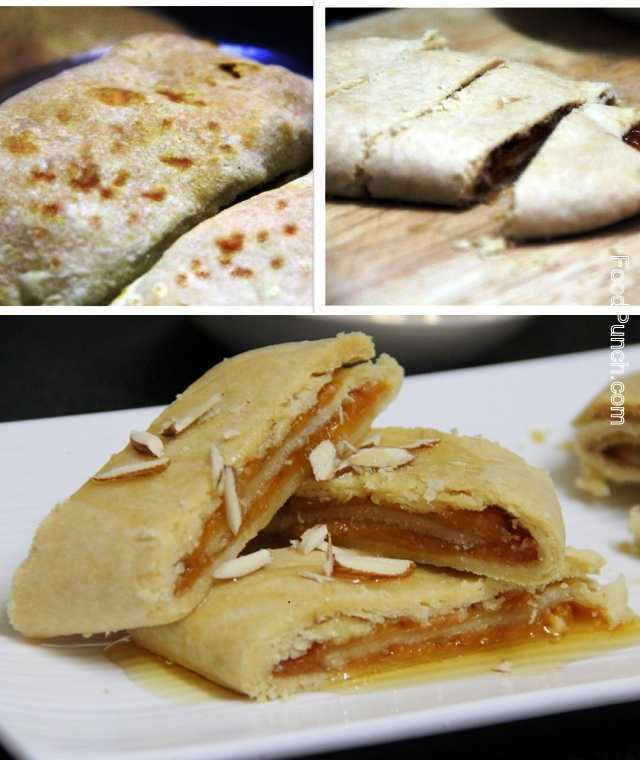 Do try using the readymade puff or filo pastry or samosa wraps available at most gourmet stores. Do not roll the dough into a thick base. Do not keep the consistency of the filling loose at all.